This is a transcript of an interview for the cover story for the October 2011 edition of the Public Accountant Magazine with Dr Greg Chapman. PA: How has the GFC impacted businesses and their pricing strategies? Dr Chapman: Businesses have become risk adverse. They have been hesitant to expand and to hire new employees. During the GFC businesses had their employees working fewer hours, rather than letting people go. Due to this workplace flexibility, unlike previous recessions, Australia was able to avoid high levels of unemployment seen elsewhere in the world, but now people are working longer hours as businesses recover. Costs have increased- particularly government related charges. Government controlled costs such as utilities have gone up a whopping 5 times inflation. Prices of other goods have not changed much unless affected by floods earlier this year. The focus is more on costs, as businesses can’t lift prices. That is, they can’t unless they have a pricing strategy, but most don’t which is why we see rampant discounting that increases turnover rather than profit. Consumers are not spending their money. Saving rates have gone up. People, unlike our government, have been paying off their debts because they are concerned about escalating cost of living increases and uncertainty in our economic future. Retail is down which flows through to other sectors. Business confidence is hit which is why everyone becomes risk adverse. The natural response to all this is to reduce your prices – or at best – don’t lift them even though costs have increased. Either way margins are squeezed. 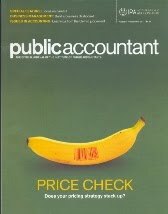 PA: What are the pitfalls of discounting? Dr Chapman: Clearly discounting slashes your margins. Even a 10% drop for many businesses may wipe out net profits completely. Mass discounting also trains your customers to seek out bargains – it indicates that what you have to sell is the same as everyone else, and so the rational choice for the customer is to seek the lower price. Discounting also makes it difficult for you to lift your prices later. Customers see the discounts as the new normal and for discretionary purchases will wait for the next sale, especially with their own costs rising. PA: What are the pitfalls of overpricing? Dr Chapman: Overpricing is just another way of saying setting your prices without the marketing support to justify them. What do you think would happen if Ford one day decided to use the BMW price list rather than their own? People won’t pay BMW prices for Ford vehicles. To lift your prices, you must change the way you market. If your business or brand is trusted by the public, price rises are far less likely to impact on people’s decision to buy – and therefore sales. Trust is paramount to cement with customers ahead of a price hike. One of the biggest reasons that people don’t buy is a lack of confidence that you can deliver what you say you will. That’s part of what a brand does. If your brand is trusted, people are more willing to part with their money, no matter what the cost. This trust can be built via clever marketing. PA: How can businesses raise prices and keep customers? Dr Chapman: Lifting prices can be a scary proposition for most businesses, but careful analysis of a business’s profit and loss statement may remove that psychological barrier of increasing prices. Once a business understands where they are losing money, the hesitancy to increase prices is removed. For example, in hotels they charge extra for same day service dry cleaning. People who are just staying overnight on their way to somewhere else will pay the 50% surcharge. Those staying several nights will take the cheaper next day option. People on the move will be price insensitive and value highly the express service. They understand why the service is more expensive and are prepared to pay for the convenience. Businesses can also repackage their services, presenting them in a way that is not easy to compare with their previous prices and those of their competitors. A simple example of this is when a cereal manufacturer changes their packaging, and puts less in the box. That is a price rise. Relative pricing is another way to increase prices. So a business might offer several packages, and if buyers are concerned about price, the conversation is turned into one about scope rather than price. Car dealers do this with their option packages. So this is all about having a strategy that can defend your higher prices so you are a price maker, not a price taker, and you become reassuringly expensive. Dr Greg Chapman is the author of “Price: How You Can Charge More Without Losing Sales".